If you are planning to buy a smoker grill, the number of options available and their features can confuse you. There are some things you should be very careful about before choosing one. On this Smoker Grill Buying Guide here at Grills Forever, we’ll discuss about 4 main types of smoker grills, their advantages and disadvantages, and some important factors you should consider before buying grills to make barbecue, smoked turkey, pastrami and a number of other hot party items. There is a saying that look before you leap. So it is always better to have a brief idea on what you are going to do. Let us know each type of smoker in detail. As the name suggests, electric smoker grills are powered by electricity and are better than the old charcoal-fuelled smoker grills. An electric smoker grill can be an excellent replacement for a charcoal smoker. A user simply needs to plug the smoker grill in and choose the right temperature. The smoker will then cook the meat at the desired temperature without any further interference. Capacity: One of the most important things you should consider while buying an electric smoker is its size and capacity. If you are the one who likes to throw parties in your backyard for your friends and family members on a regular basis, you should go for a smoker grill with a higher capacity. Moreover, if you only need a smoker for preparing meals for you and your family, a smoker with a smaller capacity can be ideal. Budget: You surely need the best smoker grill, but your grill shouldn’t cost you a fortune. Understand the features you need for your smoker and then browse multiple options to get a smoker that is both affordable and efficient. Avoid too much cheap electric smokers. As a matter of fact, many amazing models are available at almost every price range. So choose carefully and avoid over-spending. Features: Another important consideration is the features you want in your electric smoker. Modern smokers come with a number of features, like temperature settings, cooking mode, time settings, sensors, etc. Generally the more the number of features, the higher the price of a smoker. Cheap electric smokers don’t come with a lot of features. So, understand the purposes of different features and only invest in a high-end model if you need those. User-Friendly: Electric smokers are a lot more user-friendly when compared to a charcoal smoker, as they don’t require a lot of manual efforts. Also, even a novice user can get perfect results with an electric smoker,. Cost-Efficient: While electric smokers are expensive than most of the traditional smokers, they prove to be a lot more cost-efficient in the long run. Traditional smokers require you to regularly purchase the right kind of fuel or wood, whereas an electric smoker only requires a constant supply of electricity. Safety: Another great advantage of electric smokers is that they are safe. With conventional smokers, you need to keep the flame running for hours. If you have kids or pets at home, these smokers can result in serious consequences. Not Conventional: A large number of people believe that a barbecue made in an electric smoker is not as delicious as the one prepared in a traditional smoker, especially the ones that are smoked in a cheap electric smoker. Moreover, a number of users like to attend to the meat as it gets cooked and such users are not comfortable with using an electric smoker. Complicated: As these smokers are electric-based, users need to get used to their features and settings for getting the desired results. However, with a traditional smoker, users do not have to go through anything like these. Moreover, as electric smokers have a number of internal components that can malfunction, users are required to be a bit careful while using them. Price: One of the most important things you need to consider while buying the best smoker grill of this type is its price. A lot of options are available on the market at various price ranges. If budget is not something you are worried about then you can get a high-quality wood pellet grill which comes with a lot of accessories. But if you are looking for an affordable and efficient smoker grill then there are a number of wood pellet grill models available at a decent price. Availability of Pellets: It can be difficult to find pellets all the year round in some parts of the world. For people living in those areas, it is important to buy pellets in bulk. There are also a number of online stores where you can buy pellets at reasonable rates. Space: As some of the top wood pellet grills can be large, it is also very important to consider the availability of space inside your home. If you don’t have a very large space or will be moving your smoker a lot, focus on smaller models. Quality: It is also very important that the model you choose is of high-quality to protect yourself from frequent repair costs. Thus, make sure that the pellet smoker you choose is manufactured by a reputed company. Ease of Use: The most beneficial advantage of a pellet grill is its ease of use, which is majorly due to its automatic ignition. Moreover, these smokers are highly environment-friendly and the pellets used for these smokers are CO2 neutral. Highly Efficient: Pellet smokers have a high-efficiency rate of about 90%, which makes it a lot more efficient than other types of smokers. Convenient Fuel: While the pellets used for these smokers might not be easily available at some places, you can easily buy them using the internet. They are supplied in bags which are very easy to store. Another benefit is that these pellets are always ready to use. Maintenance: Any pellet smoker requires regular maintenance. The burn pot of the smoker needs to be regularly vacuumed and the entire unit needs to be cleaned at least once every 3 months. Moreover, it is also recommended that you get your pellet smoker serviced by a professional at least once a year. Noisy: Pellet smokers have a built-in ventilator and motor that produce noise during operation. However, there are many modern models that are very quiet. Expensive: As compared to traditional smokers, a pellet smoker is a lot more expensive. The automation and ease of use come at a cost which increases further with the features you want in your pellet smoker. Price: An ideal way to begin your search for the best smoker grill is by fixing your budget. If you are looking to buy the best charcoal smoker that is a complete professional charcoal smoker unit, the cost can easily reach thousands of dollars. However, if you don’t want to spend that amount of money, there are some models available for as low as $100. Generally, people spend a few hundred dollars on an efficient model. Versatility: If space is a problem, you can buy a smoker that doubles as a grill as well. In this way, you will have a single unit doing two jobs for you. Quality: If you are browsing for the best charcoal smoker grill available for sale, don’t purchase a substandard model just to save a few bucks. Many good models are available at decent prices and do an excellent job of eliminating the need to attend to the smoker for long hours for maintaining the temperature. When you buy cheap BBQ grills, you have to be cautious as they generally have poor heat regulation that can also affect the texture and taste of the meat. Usability: Also, make sure that the smoker you have chosen has adequate capacity to cook meals for your family. Smoking meat is a time-consuming process and it is important to make sure that your smoker is able to accommodate all the meat you want to smoke at once. Flavor: The coal and wood used in the best charcoal smokers infuse the original BBQ taste that you may find in the meat provided by the best BBQ restaurants of your town. Moreover, you can also experiment with different types of woods to change the flavor of the cooked meat. Maintenance: Top quality smoker grills of this type are simply designed and they do not have small parts that you generally find in pellet and electrical smokers. As a result, they are pretty easy to maintain. However, you will be required to change the grates of the smokers when these start rusting or get chipped. Other than that, they don’t generally even breakdown, thus requiring repairs. Cleaning: If your charcoal smoker has a can for catching ash, the process of cleaning your smoker will be very simple. All the ashes from charcoal will fall in this can and then you can easily dump the ashes when the can is full. Controlling Temperature: With a quality charcoal smoker, it is much easier to control the temperature of your smoker. You can easily remove the coal if you want the temperature to drop and add more if you want the temperature to rise. This ease is not generally offered by wood or electric smokers. Cooking in Winter: Depending on the quality of your smoker, smoking in the winter months can be very difficult. Cheaper models are generally made from a thin layer of metal which easily loses the internal heat during the winter months. Level of Oxygen: While using a charcoal smoker, it is very important to make sure that the internal temperature is properly maintained in the smoker. If the temperature rises higher than the required amount, it will overcook the meat. Similarly, if the temperature falls below the required levels, the meat will remain undercooked. You need to maintain the oxygen levels as well because an excess of oxygen will result in a quick heat burst which will burn the meat being cooked very quickly. Maintaining the Flame: There is also a small chance that the flame in a charcoal smoker might go out. Thus, you will be required to check the smoker frequently to prevent this problem. Reliability: If you are looking for best smoker grill of this type, make sure that you pick a model manufactured by a reliable brand. There are hundreds of gas smokers available in the market across multiple price ranges. It is your job to pick the best one that is within your budget, has all the features you want, and is from a reputed brand. Capacity: It is essential to buy a gas smoker with adequate capacity. If you want to cook just for yourself then a small, portable unit might be excellent. But if you want to cook for others, you should choose a smoker that can easily accommodate all the food you want to smoke. Materials: The material from which your gas smoker is made has a major impact on the quality of your smoker. Try to purchase a smoker that is made from thick steel and is properly insulated. If the smoker you choose is made from thin metal, it will lose heat, especially during the winter months. Price: If you are a home chef then a mid-range gas smoker might be ideal for you. Don’t just go for the cheapest model, as it won’t be able to produce enough smoke to cook meat properly. Mid-range gas smokers start at $150, so purchasing them doesn’t need a lot of investment. Easy to Use: The major advantage of using a gas smoker is it is extremely easy to use. Just set the temperature and wait for the food to be cooked. The unit will maintain the temperature without needing any further adjustments. Portability: Another great advantage of a gas smoker is that it can be used anywhere. If you love camping, you can easily carry your gas smoker with you to enjoy delicious smoked meat at the camping site. High Temperature: Gas smokers can reach to optimum temperatures which other types of smokers cannot. Some of the best gas smokers can reach up to 450 degrees C and even more. As a result, they can also be used as an oven. Requires Fuel: Needless to say, these barbecue smokers run on fuel and you will always be required to have spare fuel cans to refill the smoker when the fuel runs out. An ideal solution to avoid running out of fuel in the middle of smoking is to use a gas meter. Parts Replacement: Gas smokers have small parts that break very frequently, especially if you have a cheap BBQ grill of this type. However, unlike an electric smoker, the spare parts of a gas smoker are easily available. Moreover, they are cheaply priced. As you have read about different types of smokers available out there, you should now know what to consider before searching for any kind of quality smoker to buy. Let us have a detailed look at such factors right here on Grills Forever. Price: You can buy a cheap smoker grill available for sale at about $100 while an all-in-one smoker and grill combo can cost $10,000 and above. Remember, the more you will spend, the better smoker you will get. However, if you prefer mid-range smokers that are generally recommended for home chefs, you can get a good gas smoker for about $200, a charcoal smoker for about $300, an electric smoker for about $400, and a good pellet smoker will require you to invest $900 and above. Temperature Control: One of the most important considerations when you look forward to buying grills is how easy it is to maintain the internal temperature of the smoker. Many smoker models don’t come with a thermostat; however, pellet smokers are an exception regarding this factor. Insulation, Thick Metal, and Seals: High-quality smoker grills are made of thick metal that is properly insulated and sealed at all the right places. Thick metal distributes the heat evenly throughout the cooking chamber and radiates it back as well. This helps in reducing temperature fluctuations. Cheap BBQ grills are made of thin metal, making it extremely easy for the heat to escape, thus altering the temperature. Workmanship, Materials, and Durability: Does the smoker have sharp edges? What is the quality of welding? Does it have sturdy wheels and legs? Or Latches and hinges? Is the paintwork rust-and water-proof? How good are the moving parts? While stainless steel smokers look pretty cool, they are not always the best choice. Make sure that you answer all the above-mentioned questions before choosing a particular smoker grill. Thermometer: Make sure that you buy a good-quality thermometer along with your smoker, which can be placed at the grate level. While some of the best smokers come with a thermometer, the majority of them are cheap and unreliable. So, it is better to purchase a good one that is reliable and allows you to maintain the required temperature. Temperature Range: Also check the temperature range of the smoker. Can you reach temperatures of about 320°F for smoking turkey? Can it reach 500°F on direct heat for searing steak? Make sure that the unit you have chosen is able to keep up with your smoking requirements. Even Heat: Often, the temperature difference within the unit can be very large. Especially if you are buying an offset cheap BBQ grill, the temperature difference between both ends can be as large as 50°F to 75°F. Dampers: If you are planning to buy either a charcoal or a wood smoker, remember that the heat in these smokers is controlled by cutting oxygen supply. For this reason, your smoker is required to have a damper on the chimney and another damper on the firebox. Ensure that the damper is easy to use and reach. Storage and Work Surfaces: Many top quality smoker grills come with work surfaces and built-in tables. You can use these for keeping tools, cutting boards, sauces, mitts, etc. The bigger the work surface, the better it will be. Some smokers also feature storage cabinets and bins. Support and Warranty: How is the reputation of the dealer in the market? What is the type of guarantee and/or warranty comes along with the unit? Are there any email addresses or phone numbers mentioned on the box for tech support? How informative is the manufacturer’s website? Is the manual helpful? Where will you get spare parts for the unit? Will you be able to get the spare parts after 5 years from now? These are some important questions you should consider carefully. Safety: It is also important to buy a barbecue smoker that is safe for children and pets. If the smoker has wheels, do they lock? Are the electric parts safe from snow and rain? Are the handles heat-resistant? Cheap BBQ grills generally have wooden handles that do not last for a long time. Try to go for a smoker that has coiled handles that are made of stainless steel. They are durable and they easily disperse heat to stay cool. Access: Search for a wood or charcoal smoker grill that provides an easy access to the firebox for ensuring that you are able to effortlessly add fuel. Also, make sure that the access to the cooked food is easy. Cabinet-type smokers that load from the front side offer easier access as compared to bullet-type smokers that load from their tops. Space: It is also important to have adequate space not just to place the barbecue smoker, but also for flowing air and ensuring that nothing is close enough to catch fire. Tall Enough to Accommodate Large Turkeys: If you want to smoke a turkey, the smoker should have adequate space for it. The space between the top of the smoker and the rack should be at least 12 inches. Wide Enough to Accommodate Long Rib Slabs: Some rib slabs can be as wide as 16 inches. While you can always cut the slabs in half, the edges will be a bit overcooked. It means you will have more amount of overcooked meat if you cut the slab in half. Grill: Some of the offset smokers feature a rack that can be used for grilling. 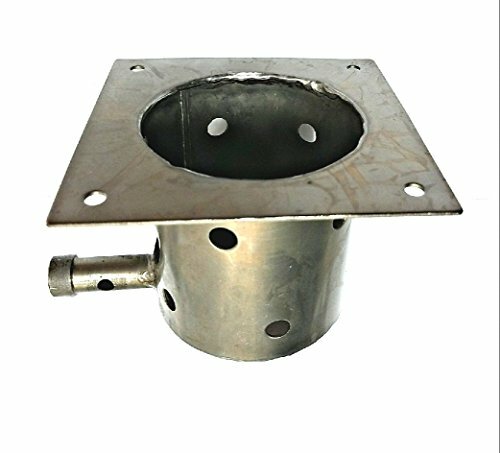 Moreover, there are also some bullet smokers that can be transformed into a grill by removing their center parts and water pans. Check if there is a grill in the smoker, can its heat be controlled? Can the fire or meat be moved? Wheels: Also make sure that your smoker has a sturdy set of wheels. If it doesn’t feature wheels, then it should be easy to disassemble. Water Pan: Some of the top smoker grills feature a pan above the heat source. The pan can be filled with water, wine, beer, herbs, etc. But actually, it is meant to be filled with water. Water helps in reducing the fluctuation of the internal temperature and in increasing humidity to make sure that the meat being smoked doesn’t dry out. Drip Pan: Different fluids, like fat drip from the meat being cooked. While you can let the liquid fall into the fire, quality smokers feature a drip pan where all the liquid gets collected. You can use it as a sauce or just dispose of it. Easy Cleaning: Cleaning the exterior part of a smoker is optional, but the interior is compulsory. When you smoke, fats, juices, and seasonings will fall and splatter. These splatters can easily turn into a breeding ground for bacteria. Moreover, burning of the rancid grease will make your meat unpalatable. While increasing the temperature will generally kill everything, you will still be required to thoroughly clean grates. Stainless steel grates are very easy to clean. Grates made from chrome deteriorate and start rusting with the passage of time. You cannot put these grates in a dishwasher, as everything in the dishwasher will be coated with grease which will be very difficult to remove. If you love smoked food, buying grills will be one of the best decisions of your life. As you now know a lot about different types of smokers, their advantages and disadvantages, and the factors that you should consider while buying a smoker, you are all set to begin your meat smoking journey. If you still have any queries or if you are unable to choose a smoker, feel free to comment below and our Grills Forever team will try to get back to you as soon as possible.